Growing up in Nigeria exposed gave me a deeper appreciation of the uniqueness of African prints. The style, colors, and patterns are endless. You’ll also find that many of these patterns hold cultural significance from they area they originated from. Some African print fabrics include ankara, kitenge, and kente. 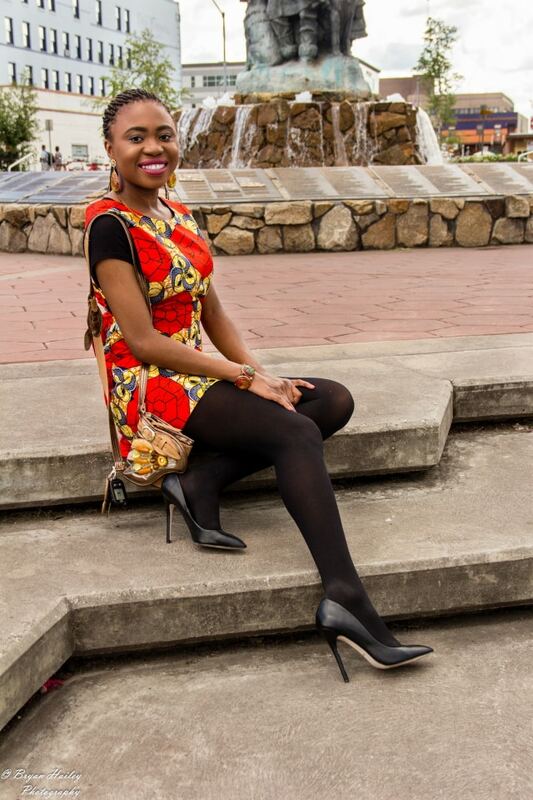 For this blogger collaboration, I teamed up with Yvonne to style an ankara African print outfit. For more than 6 months in the year, I am stuck wearing layers of thick fall/winter pieces in Alaska. Come summer, I dust off my favorite summer styles and put them on heavy rotation. 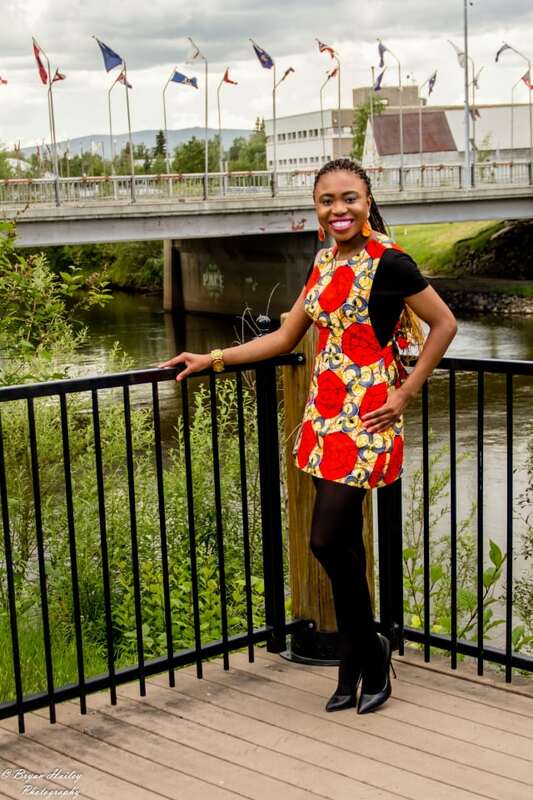 I noticed that my friend, Kim Dave, had this vibrant ankara African print pinafore dress on her store. Everything about this ankara dress spoke to me, so I bought it. I cannot tell you how many times I’ve gotten stopped by strangers asking about how too can get this lovely ankara dress. I’ve been a big fan of Yvonne’s style for years. 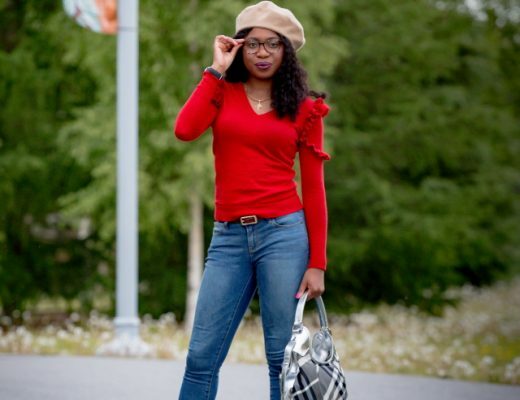 Yvonne is the fashion blogger and creative mind behind the blog, Hello Yvonne. 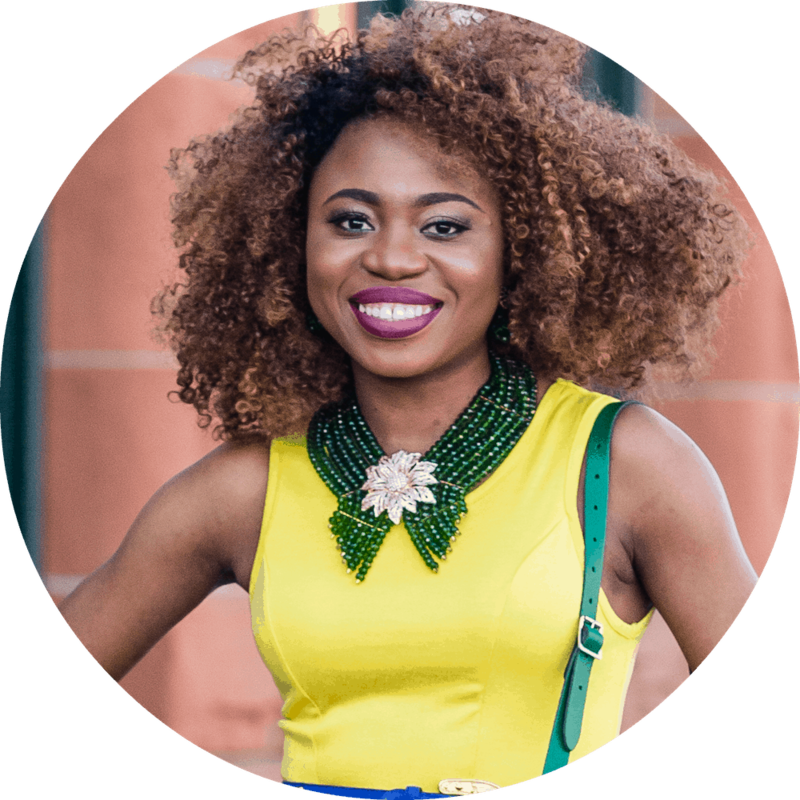 Although based out of Texas, she has strong Africa ties to Nigeria (yes!) and Cameroon. I seriously can’t get over her amazing shoe and ankara African print collection. Her tailor seriously sews the best traditional African styles. 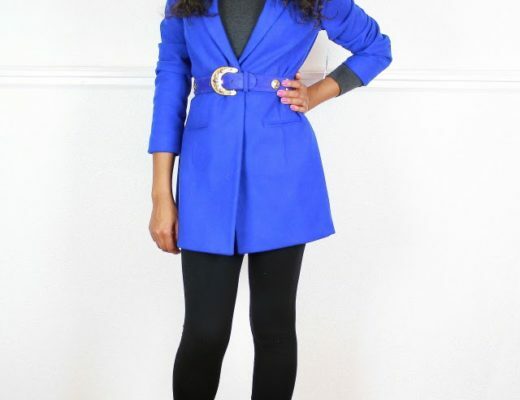 Not only does she have impeccable style, she is also a nurse practitioner! 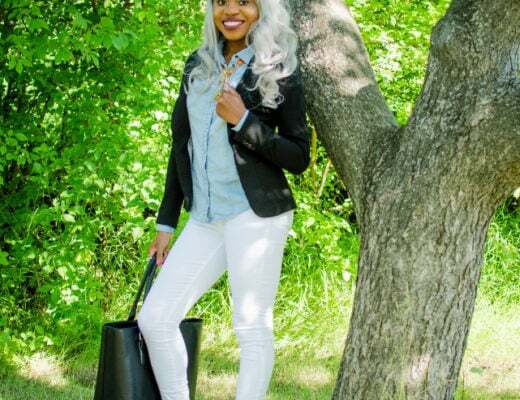 ARE YOU A FASHION BLOGGER? LET’S WORK TOGETHER. CLICK HERE. 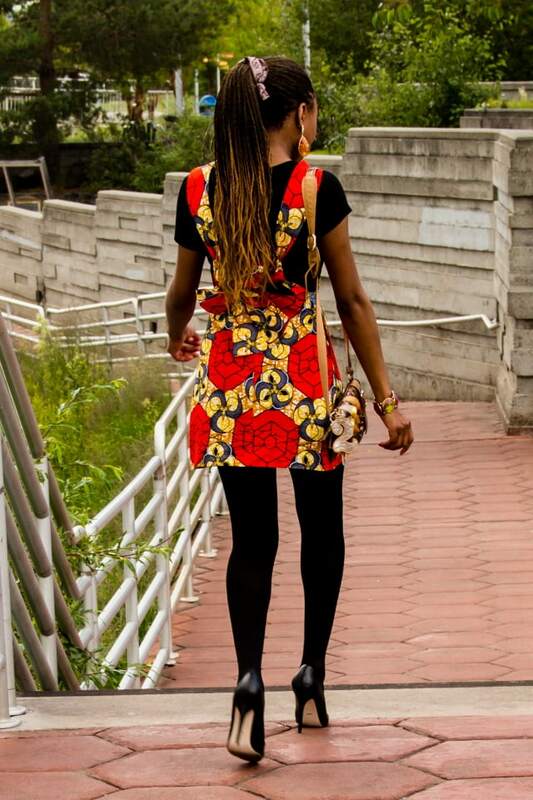 For my look, I chose my ankara pinafore dress with a simple black fitted t-shirt and a pair of black opaque tights. The back of my ankara dress comes with a piece of fabric. The fabric can be knotted into a bow for aesthetics and to tighten the fit of the dress. I finished up my look with a pair of classic leather pumps (on sale), a matching beaded crossbody bag, and a set of iridescent jewelry. Yvonne wore a chic flare ankara African print skirt paired with a white button-up shirt. She complimented her look with a set of beautiful red stilettos and structured crossbody purse. 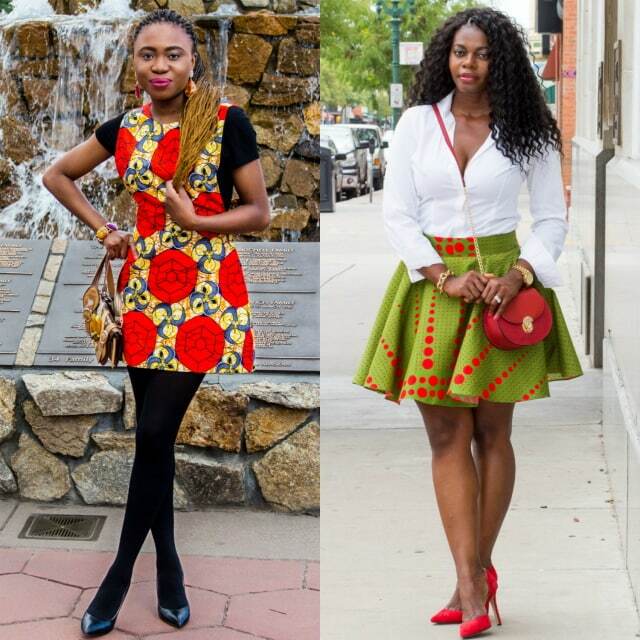 This girl has mastered the art of infusing traditional African clothes with mainstream pieces. 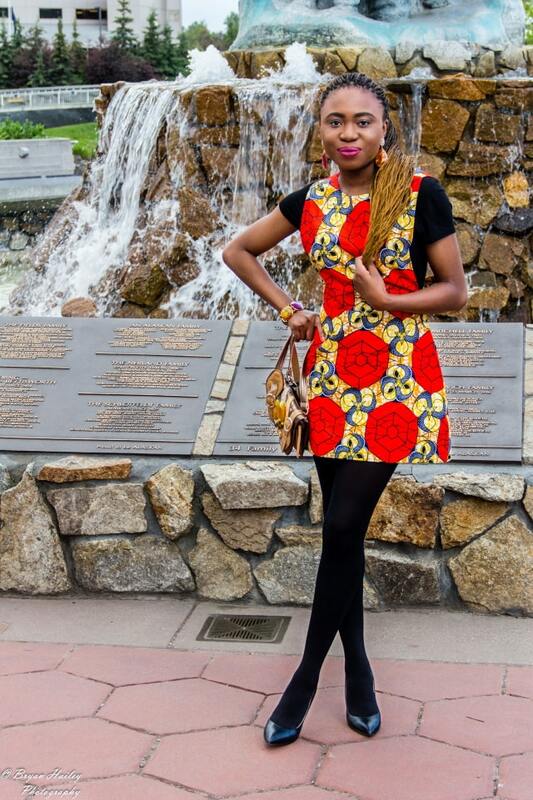 See how she married both concepts in this ankara top look. Want to see the rest of her outfit? Head over to her blog, Hello Yvonne for more. You can also find her on Instagram and Facebook. GIVEAWAY: Enter to win over $700 worth of Clothing and Blogging tools! wow ! This is so inspirational and cute!! ADORE this post! Beautiful outfits, ladies! I love the Ankara African prints. My friend is from near Nigeria and she always had the most beautiful African prints when we were in college. I love how Yvonne paired red high heels with the ankara print skirt. And the dress goes really well with the black opaque tights. Hope to find you on Instagram! Cute outfits! I especially like the green skirt! The form of it is great! Thanks Abby. Yvonne’s skirt is amazing! I have been in love with this print. Just made my first purchase of a dress with the print. Loved your post. Thank you Christin! I’m sure you’ll love your print dress. Hi there! 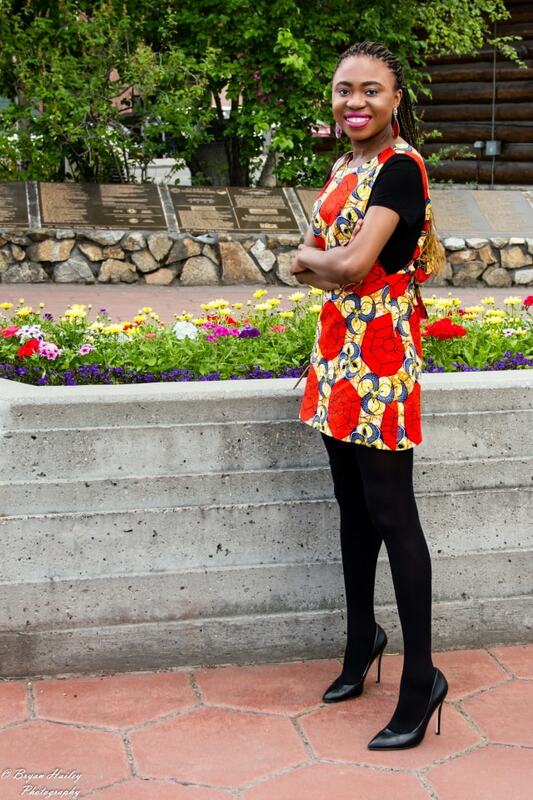 I grew up in Niger (my parents are missionaries) and I am drawn to African print fabric like a moth to a flame. It is SO beautiful. One of my favorite things is the marrying of African wax print with a modern day style…I’m not very stylish, but it gets me every time! Thanks so much for sharing this! Beautiful style and clothes! Love this!